Hi, Byrdie beauties! If you’ve been following my monthly columns, you probably know I’m a huge beauty lover. But you may or may not know I’m also kind of brow obsessed. I haven’t always been a fan of my strong brows (more on that below), but I learned how to make them work for me. And today, I’m spilling all of my brow secrets. Scroll through for my best tips and tricks! I’ve always had very thick eyebrows. Actually, in grade school, I remember the boys laughing and telling me I had a unibrow. LOL! I remember begging my mom to let me get them done. I guess the “bold eyebrow” trend worked in my favor, but it’s funny to think I used to be really self-conscious about them. I spent many years waxing my eyebrows, but I recently switched to strictly tweezing. I think hot wax can be a little too harsh on my skin. I also trim them regularly—about once a week. Threading makes me nervous because I honestly don’t trust someone using their mouth as a guide to pull the hair. I’ve also had some bad experiences with over-threading. I’ve tried brow shapers (those little razors). I wouldn’t recommend these either, because they don’t pull the hair from the root and can result in ingrown hairs. I usually do my eyebrows myself, but every now and then, I love getting them done by Anastasia at Anastasia Beverly Hills. When I’m on the East Coast, I’ll go to Sania at Sania’s Brow Bar. 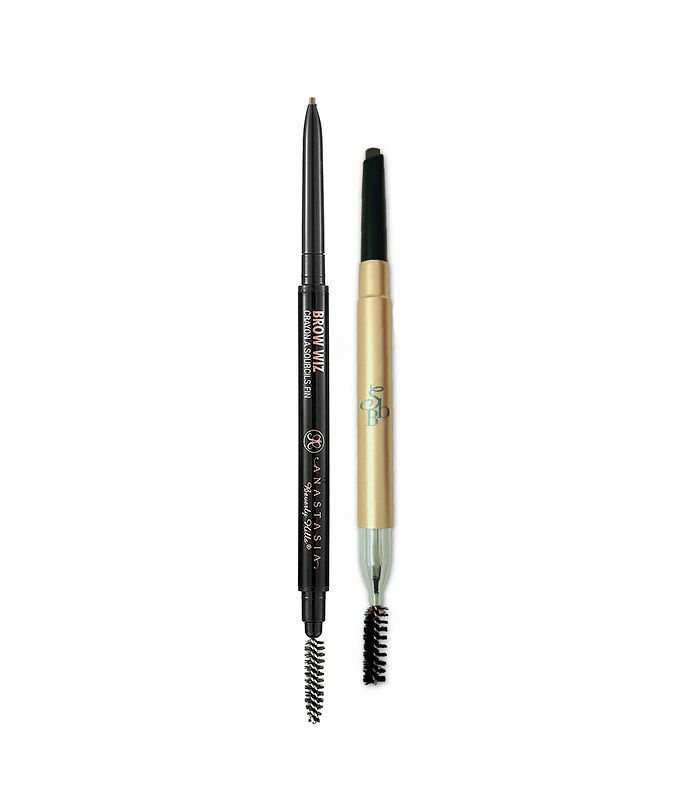 Both are amazing and have great brow products! I try to pluck my eyebrows every other day, and by “pluck,” I mean I’ll pluck about 10 hairs and that will be enough upkeep for the day. I would rather do a little at a time then just wait until they get really out of control. I guess it’s a blessing and a curse when you have a lot of frequent hair growth on your brows. Every morning, after washing and moisturizing my face, I wipe off any moisturizer that may have gotten caught in my brows. Then I simply brush them—usually with the spoolie end of a brow pencil, like Sania’s Eyebrow Pencil ($30). If they need to be trimmed or plucked, I will do that. First I trim, and then I pluck. I would say if you have thicker hair like me, you should aim to pluck about five to 10 hairs every day or every other day. This way you can avoid letting them get too crazy or out of control, and you won’t have to clean up a crazy brow mess! I don’t fill them in every day, but when I do fill them in, I love to use Anastasia’s Brow Wiz ($21). I just lightly fill in the places that may need a little more color. Then I will brush over the area so it blends in with the rest of the hair and doesn’t look too obviously penciled in. Fun fact: I also like to do my friend’s brows. The trick to shaping your eyebrows and creating more of an arch is to keep the hair at the front of the brow shorter and the hair closer to the arch longer. I think of it as a staircase. Brush up your eyebrows and make sure the hair at the arch is the highest point and trim the hairs at an angle so the hair decreases in length at the front of the brow. So, how’d I do? Groomed brows make such a big difference! How do you maintain your brows? Share your brow secrets with me in the comments below!